Each year the conference program offers so many tracks that there’s something for everyone, whether a beginning or published author. Or, as was pointed out at the conference, a hybrid author, one who is both traditionally and self-published. This new term is just one example of how the publishing industry is changing and how helpful it is to associate with several thousand other writers, editors and agents to expand one’s knowledge. For many like myself, it’s also an opportunity to see friends and acquaintances. Particularly memorable was the conference keynote address by Cathy Maxwell, best-selling author of more than 30 romance novels. I was honored to sit at her table surrounded by her publisher, editor and publicity director representing Avon Books along with authors and friends. Cathy recounted attending her first conference and realizing that she was “where she was meant to be” and using discipline and focus to achieve her dream of becoming a published author. But the overall theme was that each of us is “good enough” and that we shouldn’t ever doubt ourselves. Our table sat spellbound–some with tears in their eyes–and coffee and a delicious cheesecake went untouched while Cathy held us mesmerized. At the conclusion of her speech, Cathy was presented with a gift from RWA and later urged to unwrap it at our table. It was a beautiful crystal pencil holder! 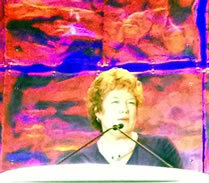 Her day wasn’t yet over as Cathy later spoke on a panel titled “What’s a High-Concept Series (and How Do I Write One)? New York Times bestselling author Carla Neggers and I found time to chat between her autographings and workshop titled “Writing as Work/ Writing as Play: Does It Have to Be Either/Or?” Carla reports hearing that many industry “insiders” feel romantic suspense is on the upswing. I had many workshops circled in each day’s program. The problem is that often several are at the same time, the room is filled to standing room only or you meet a friend who urges you to join her for coffee, lunch or a drink. What’s a gal to do? Thank goodness most of the programs are recorded and I ordered the full set. I’m planning on listening to all those that I missed! Oh, did I mention the publisher book signings? 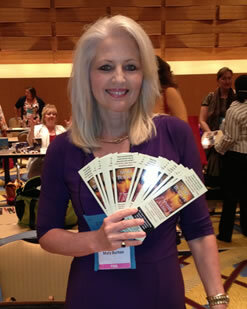 Authors assemble in large rooms and sit at tables with stacks of their FREE books. Each author autographs for fans who stand in line until books are all gone. Fortunately, there is a mailing facility in the hotel for the books that so many attendees ship home. I didn’t always get to each of these signings–held over various days–but did get autographed copies of the latest Lisa Gardner and Karen Robards books! Besides multiple workshop tracks (Career, Craft, Self-Publishing, Spotlight, Writer’s Life and Research plus untaped workshops for published authors only) there are also private cocktail parties and dinners. At the Ballantine Bantam Dell cocktail party, held at the White Oak Kitchen & Cocktails, I enjoyed seeing Linda Marrow and Gina Wachtel who both welcomed me so warmly. 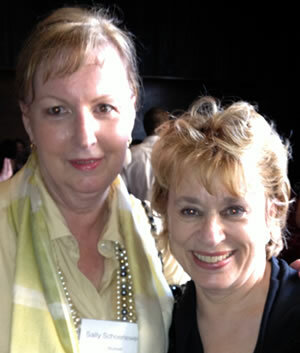 Of course, meeting Jude Deveraux, romance industry legend, was a treat. An invite from author Bonnie Vanak to accompany her to the Harlequin party afterwards was a hoot and a group piled into our cab to the Ritz Carlton. The cab driver thought we broke his record for the number of passengers in his cab! One of whom was the delightful Ann Major, author of 70 novels and a founding member of RWA. She’d sent me a lovely note of encouragement at an especially low point in my life so it was a distinct pleasure to finally meet her. We enjoyed our time at the Harlequin party complete with an array of fabulous desserts and dance music and later left to enjoy a leisurely dinner at our hotel. Oddly, nearly everyone we’d been hanging out with at the party arrived to join us there! Nothing like a late dinner with friends both old and new. If you’d like to know more about what others learned at the conference, I recommend reading the following blogs by Bonnie Vanak and Barbara Vey. We all had different experiences which is what makes the annual RWA conference so wonderful and inspirational.